Researchers at the University of Rochester Create a Three-dimensional,Transmitting, Continuously Multidirectional Cloaking Device. Inspired perhaps by Harry Potter’s invisibility cloak, scientists have recently developed several ways—some simple and some involving. A news ‘invisibility’ cloaking device has been unveiled by US scientists – which they say can be constructed at home, causes no distortion of objects in the background, and can conceal objects in 3D from different angles. 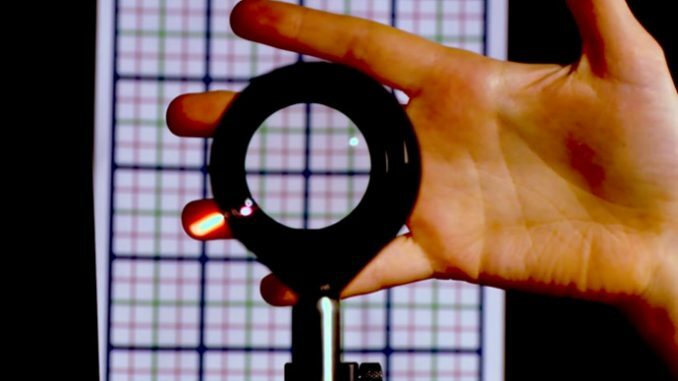 Scientists from upstate New York’s University of Rochester have managed to create the device, which looks like a set of optometrist’s equipment and can bend light around the “cloaked” object so that it appears invisible. The lenses used in the process are easily obtainable and inexpensive. However, while “cloaking” the object, it is not currently in cloaked form, and remains a series of layered lenses which makes the object placed behind appear as if it is not there. “A lot of people have worked on a lot of different aspects of optical cloaking for years,” said John Howell, a professor of physics at the institution. “From what we know, this is the first cloaking device that provides three-dimensional, continuously multidirectional cloaking,” added graduate student Joseph Choi. Previous projects working on concealing objects with “invisibility” have had limitations in that the illusion only works at a certain angle. Previous methods have also been far more complex and expensive. The tests have seen the scientists hide a hand, someone’s face and a ruler. However, one limitation to the device is that it is objects on the edges of the lenses that remain out of sight, whereas those directly in the middle may still be at least partially seen. However, the scientists maintain that the possibilities as a result of the device’s development are endless. “I imagine this could be used to cloak a trailer on the back of a semi-truck so the driver can see directly behind him,” Choi said. “It can be used for surgery, in the military, in interior design, art.” As with the “Harry Potter” invisibility cloak, no distortion of background objects occurs. In February 2013, an “invisibility cloak” was developed and displayed at a US tech conference by Dr. Baile Zhang, an assistant professor of physics at Nanyang Technological University in Singapore. However, it didn’t work from various angles. Scientists at London’s Imperial College, Duke University and the University of Texas have also been working on similar designs. Scientists for the first time succeeded in “cloaking” an object in 2006, after which the Imperial College researchers laid out their theory for others to copy. In 2011, a physicist at the University of Texas Dallas successfully created a small invention that uses carbon nanotubes to make objects behind it disappear. At Duke, inventors used meta-materials to create a tiny cylinder that bends electromagnetic waves and makes objects vanish. Is Aging Turkey Point Power Plant The Next Nuclear Disaster ?